Male Vermilion Darter. Pinson, Al. As they’re cruising down Alabama State Highway 79, most motorists have no idea they’re breezing past one of the Southeast’s most beautiful and imperiled fish. In a tiny, spring-fed run bordered by the four-lane highway and surrounded by a desert of asphalt, the wheels of passing trucks and cars pass within a few feet of one of the few known populations of the brilliantly colored Vermilion Darter. 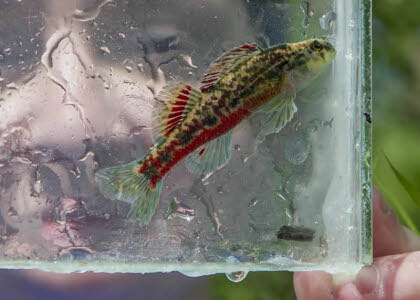 The federally endangered Vermilion Darter has only been found in a few miles of waterway in Turkey Creek and its tributaries in Pinson, Al., about 15 miles north of Birmingham. It shares this unlikely urban oasis with another imperiled fish, the Rush Darter, which is only found here and in two other watersheds in north-central Alabama. A significant portion of these fishes’ range lies within a metropolitan area of more than 1 million people. But thankfully, just in time for Endangered Species Day, recent population surveys conducted by the Tennessee Aquarium Conservation Institute have found that these imperiled fishes are doing surprisingly well despite their perilous location. “We refer to these darters as ‘urban darters’ because they’re found right in the center of an urban environment,” says Tennessee Aquarium Conservation Institute biologist Dr. Bernie Kuhajda. “That we’re finding these fish here shows how resilient they are." 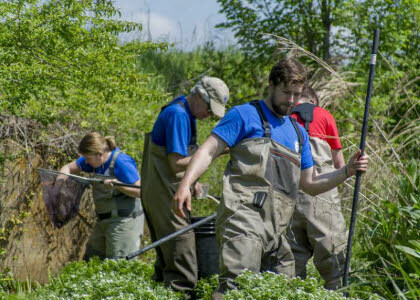 In late April, Dr. Kuhajda and a team of researchers from the conservation institute visited sites in Pinson to evaluate the population health of these endangered species. Despite being similar in length, these tiny fish look wildly different. The Rush Darter has a gold-and-brown-speckled body and pale, striped fins with dark tear streaks under its eyes. Vermilion Darters — especially the males — are riotously colorful with brilliant orange-red bellies, red-speckled bodies and fins edged by bands of turquoise and crimson. Both darter species have been dramatically impacted by human activity. Alterations of stream channels have limited their ability to move, and runoff-borne sediment and chemicals are choking their waterways. Due to the abundance of nearby impervious surfaces — including roads, rooftops and parking lots — water levels in the few streams where they have been found can fluctuate wildly, nearly drying up at times and raging in flood-like torrents at others. Last September, Dr. Kuhajda began a two-year U.S. Fish and Wildlife-funded survey of six threatened and endangered species of fishes in the uplands of the Mobile Basin, an area comprising parts of Alabama, Georgia and Tennessee. 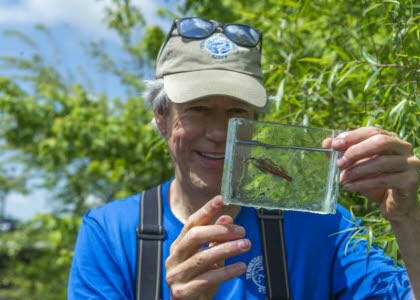 In addition to the Vermilion Darter and Rush Darter, he also is monitoring the Blue Shiner, Cahaba Shiner, Goldline Darter and Watercress Darter. Dr. Kuhajda’s current survey is a kind of biological checkup for populations scientists most recently evaluated in 2014 and some as far back as 2001. By returning to previously-monitored sites to net and measure fish, scientists can compare collection samples to determine whether a population is in decline, improving or holding steady. Despite the many threats to their existence, both the Rush Darter and Vermilion Darter appear to be doing well, Dr. Kuhajda says. 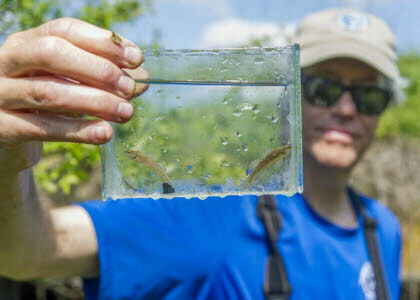 In addition to locating individuals at previously visited sites, Kuhajda and his team of researchers also collected a Rush Darter during a Bioblitz on April 27 in the Turkey Creek Nature Preserve. This new location was more than a mile downstream from the previously estimated border of its range. The 466-acre Turkey Creek Nature Preserve owes its existence, in large part, to the discovery of Vermilion Darters in the creek. In the late 1990s, the construction of a jail in Jefferson County was halted by the discovery of the endangered darters in the waterway near the proposed building site. The fish’s role in upending the unwanted project endeared it to the community, and its likeness appears on a sign at the entrance to the preserve, which was established in place of the corrections facility. Finding a new population inside the refuge was an unexpected and much-welcomed surprise, says Charles Yeager, the preserve’s manager. The community’s awareness of — and desire to protect — an endangered fish is likely contributing to its relative success, Dr. Kuhajda says.